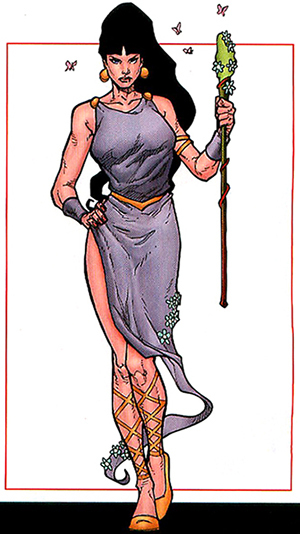 Powers/Abilities: Persephone possesses the standard attributes of an Olympian goddess, including superhuman strength (lifting 25 tons), durability, virtual immortality (including immunity to aging) and resistance to disease. Only destroying a significant portion of her body could kill her, though Zeus or other gods may be able to resurrect her. 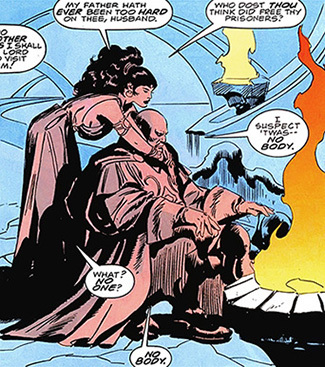 She can apparently alter her appearance, appearing blonde on at least one occasion while not in Tartarus; possibly she is dark-haired in her Queen of the Underworld role, but blonde in her fertility goddess aspect. She can apparently transport herself to other locations via traveling through Hades. Through size alteration or illusion, she can tower over her subjects in Tartarus. As Queen of the Underworld, she has some level of command over the spirits that dwell here. When not in Hades, she can influence the growth and vitality of plants over a large, undefined area. (Greek-Roman Myth) - Persephone is the daughter of Zeus and Demeter, the grain-goddess. The god Hades fell in love with her and obtained permission from Zeus to take her as a bride without telling Demeter. In fact, Zeus is reputed to have suggested abduction to keep Demeter from knowing the truth. Abducted while in the presence of her friends the Sirens, Persephone was taken against her will to Tartarus where she pined for her mother and refused to eat. Demeter mourned for her daughter for ten days before Hecate, looking to make trouble for Hades, told her the truth. Unfortunately, while in the underworld, Persephone fasted by eating three pomegranate seeds. As Zeus arbitrated the case, Persephone was required to spend parts of the year on Olympus and Hades. Demeter also punished the Sirens by transforming them into birds and binding them to Anthemoessa as punishment for not reporting the abduction. In later years, Persephone played an active role in dissuading Hades' whims against mortals as in allowing Queen Alcestis of Pherae to return to her husband. Aphrodite also gave her a coffin with the spirit of Adonis in it to hide for her, but she peeked inside and fell in love with the youth. Zeus arbitrated their feelings over him and forced them to share him separately. Years later, Peirithous, the king of the Lapiths, and his good friend, Theseus, King of Athens, both made pacts to marry daughters of Zeus. Theseus abducted the teenaged Helen (future spoil of the Trojan War) and Peirithous resolved to abduct Persephone. Admiring the guts of the two, Hades invited the two to sit down from their journey into the underworld and they became captured in chairs. Hercules rescued Theseus on his last labor, but Peirithous was forced to stay. Years after the Trojan War, Orestes, prince of Mycenae, invoked Persephone to send the ghost of his father, Agamemnon, to watch the death of Aegisthus, his killer. (Avengers Annual I#23) - In modern times, the Olympians were nearly snuffed out by their ancient enemy Typhon, who had escaped Tartarus. They were rescued by Hercules and his modern team of heroes, the Avengers. Zeus questioned Persephone about Pluto, suspecting that he had released Typhon himself, but she vouched for him, saying he had not departed her sight. Unbeknownst to Persephone, Pluto had actually granted the Asgardian god Loki with the power to free Typhon. (Fantastic Four III#21) - Returning from a visit from her mother, Persephone issued an edict to Pluto to allow the young wards of the Fantastic Four to leave his realm unharmed. (Hercules: Fall of an Avenger#2) - Amadeus Cho encountered Persephone in Hades after Pluto, tortured by Phobos, opened a portal for him. Persephone protected him from demonic creatures and then revealed that Hercules wasn't in Hades. (Chaos War#2) - Persephone and Pluto watched images of the Chaos King (Amatsu-Mikaboshi) throwing most of humanity into a death-like, waking sleep. Distressed by the fact this denied him the souls of millions of sinners who otherwise had gone to Hades, the lord of the underworld was comforted by Persephone who assured him all who live would one day be his. Moments later, Hela bursted through the walls of Pluto's inner sanctum to warn him the Chaos King had sent his alien god-slaves to decimate the realms of the dead. Comments: Adapted by Roy Thomas and John Buscema. Arion, the god of horses, and Despoena, goddess of fruit, are children of Demeter and Poseidon. Plutus, god of wealth, and Philomelus, god of farming, were children of Demeter and the demi-god, Jasion. They have yet to be seen in the Marvel Universe. 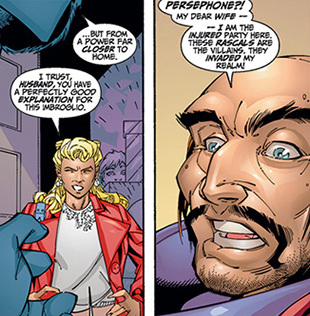 Persephone's hair color goes from dark in Avengers I Annual#23 to blonde in Fantastic Four III#21. It has since been confirmed in her handbook entry her hair remains dark while in the underworld but becomes lighter when she visits her mother every spring. No etymology, or source, has been found in Greek for Persephone's name, hence it is likely that her name is pre-Greek (which would explain all of her Greek aliases--everybody had a difficult time saying her name). In fact, she may have been a pre-Greek goddess. Persephone was first identified as Demeter's daughter in Hesiod's Theogony. The myth of Persephone's abduction and Demeter's grief appeared for the first time in the Homeric Hymn to Demeter. There is another tale, an Orphic myth, about Persephone by the epic poet Nossus of the 5th century AD that falls outside traditional lore but deserves mention, nonetheless. In it, Persephone was desired by all the gods yet kept secured at home by her mother. She was taken to Sicily and guarded by dragons, but Zeus, in the form of a dragon, seduced her. From this encounter, she eventually became the mother of Zagreus, the earlier form of Dionysus, whom the Titans tore apart. This account is probably the source of the misconception that Persephone and Zeus are the parents of Dionysus. In Ancient Greek mythology, Persephone NEVER had an affair. In fact, the Elysian mysteries (Persephone's main cult), strangely, believed that Persephone and Hades had a faithful and a loving marriage with each other. Making them into one of the very few married couples to actually be faithful to each other, in the original mythology. However, in the "modern" era, the Romans started claiming that Proserpina (Persephone) became infatuated with Adonis, for some time. Although, in the original myth of Adonis, which was invented by Ovid in the first century a.d., Proserpina (Persephone) never appeared in it. The Romans changed quite a few things of the original mythology. For example, they claimed that Pluto (Hades) was "in love" with Proserpina (Persephone). When in "Homeric hymn to Demeter" he wasn't. And he only kidnapped Persephone at the behest of Zeus. They also claimed that Proserpina (Persephone) fell in love with Pluto (Hades). While Roman Christian authors started claiming that Proserpina (Persephone) was "ravished" by Pluto (Hades). Even though, no Ancient Greek author ever claimed that. But there probably was some justification with Proserpina (Persephone) learning to love Pluto (Hades), since Homer, the alleged author of Persephone's original abduction myth, had Persephone embrace her role as the queen of the underworld. And it seems by Homer's account, Persephone grew to like being Hades's queen.